Anyone know what this new-to-me vegetable is in my garden this season? 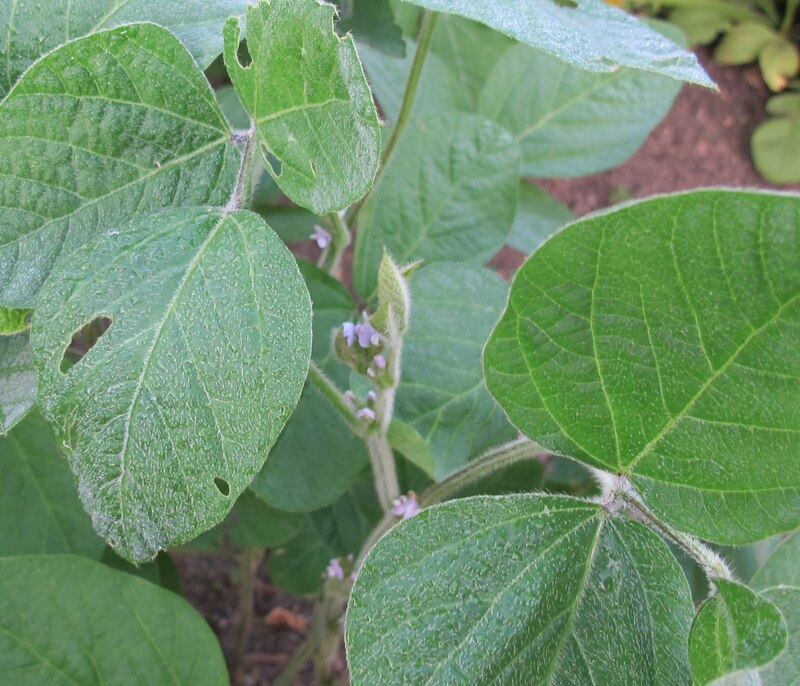 If you guessed Glycine max, soybeans, you would be correct! In particular this is 'Midori Giant' from Nature's Crossroads, a local Indiana seed company that specializes in varieties of vegetables that do well in Indiana and the Midwest. I've attempted to grow soybeans in my garden before but the rabbits always ate the young seedlings down to nubs, so I never saw a single actual soybean. This year my luck has changed or my rabbit deterring technique has improved because I've got nice big healthy soybean plants. 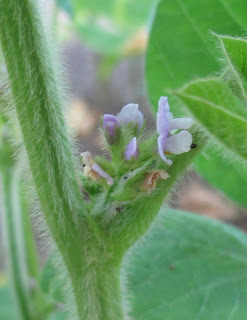 This particular variety of soybeans is supposed to have a sweet, buttery taste and be high-yielding. The more you pick the more they produce. They are flowering now. Some gardeners and chefs refer to these soybeans as edamame. I've been referring to them as "edible soybeans" which gives people pause because technically, all soybeans are edible. Perhaps a better name if I don't want to say "edamame" is "sweet soybeans". Then people would get it right away because they are used to farmers growing field corn and gardeners growing sweet corn. The soybeans appear to be easy to grow. Just sow in rows like you would green beans, water, and keep the rabbits away. These will take about 75 days to start producing. I planted them on May 31st so the first tender soybeans should be ready to pick around August 14th. Maybe sooner. In Indiana, there are thousands and thousands of acres of soybeans grown every year, yet in the book Field Crops by A. D. Wilson and C. W. Warburton, published in 1918, there is not one mention of soybeans in the table of contents or the index. But I did find information about it on page 374. "The soy bean does not yet occupy a very prominent place in the United States, though its importance is increasing rapidly." The authors further note, "Much that has been said regarding cowpea applies equally to the soy bean." Cowpea? Who grows those any more? The authers of Field Crops also wrote, "Before many years, they are likely to become a common article in our diet and their cultivation is certain to increase immensely, for the uses of this plant as oil, food, and forage are very numerous." I feel myself falling into a rabbit hole. Someone grab my hand and pull me up! Yummy! Edamame is a favorite here, many ways to enjoy those green beans! I have grown Cowpeas; mostly as a novelty...they produced well in a dry year and seemed to harbor no pests, but I've never repeated the trial. Have grown soybeans (edamame) as well, but not crazy about them. I grow cowpeas too. A lot of people in this area do. I wonder how well they'd do in my garden here in outskirts of Boulder, CO? Off to look up seeds. I'm growing black eyed peas (along with my beloved limas)--so close to a cow pea. I will definitely be growing cowpeas when the black eyed peas run out because they are delicious! Baker Creek has lots of heirloom cowpeas.